Part of what makes the search industry exciting is its unpredictability. Every week, new announcements create opportunities for brands to deliver better customer experiences through search. The size of that opportunity looks set to grow at an eye-watering rate through 2020 when it is predicted $79 billion will be spent on SEO services and technologies. This can also make search marketing a challenging field. The desire to make sense of increasing complexity is one reason that SEO spending will grow at such a rapid rate, after all. For enterprise brands, long-term planning is vital and SEO specialists are increasingly likely to have influence in the boardroom. As such, we can’t simply react to the latest trends if we want to gain a competitive advantage. So, how can we set a long-term enterprise SEO strategy when things change so often? Fortunately, amidst the flux that defines the industry, there are some clear signals that tell us exactly where we’re going. If we alter our conception of search and think beyond the traditional web, we can see that the pieces are falling into place already. In a fragmented hardware market, with Internet-enabled devices appearing in our homes, our cars, and our pockets, search is a unifying force. The chart below, taken from The Economist, reveals the trends that executives believe will have the biggest impact on marketing by 2020. These trends intersect with search in different ways. Equally, they will all enable search to take a more prominent, valuable role in the lives of consumers. Enterprise brands should take note and lay the groundwork for the future today, by focusing on three areas that are already re-shaping the search industry. Visual search turns a smartphone into a discovery engine, taking an image as its stimulus to provide related results. The benefit of this is that consumers can search for something without having to describe it through text. It is sufficient to show the search engine what we are interested in and it can do the rest on our behalf. This can be placed in the wider context of “queryless search,” a development that sees search engines either preempt or interpret a consumer’s intent without the need for an explicit query. In fact, Gartner thinks that by 2020, 30 percent of all searches will be conducted without a screen, while over 100 million consumers will shop in augmented reality by the end of this decade. Visual search is in prime position to benefit from these trends. Early leaders in the field include Pinterest, Google, Amazon, Microsoft, and a host of retailers who can see the huge opportunity visual search presents. Thus, the appeal of visual search is self-evident. It can search for us when we don’t have the words to explain what we want. Pinterest reports that it handles more than 600 million visual searches per month already via its Lens tool, so there has been some impressive uptake among consumers. The technology required to understand images is very sophisticated. There has been significant progress in this area, with Google Lens, Pinterest Lens, and a range of visual search products from retailers all reporting increased accuracy. However, as marketers, we need to help search engines by providing the right information in the right formats. Otherwise, they are left to decipher a very unstructured environment with no clues. Cover the basics: Upload image XML sitemaps, check the indexation status of images, and keep product inventory up to date. Conduct in-depth research: People use visual search to complete different tasks. Try to understand these demand states so you can meet their needs with the right content. Optimize images: Images should be optimized using standard image SEO best practices, but there are other factors to consider for visual search. Remove clutter from images, keep focus objects in the foreground, and maintain a consistent aesthetic that is unique to your brand. This will help search engines understand who you are and which products you want to promote. Use meta data: Meta data elements are essential markers of context and are used heavily by the likes of Google and Pinterest. Ensure that you are using the right Schema.org markup and use relevant key phrases in metadata tags. The analog/digital dichotomy we know today will dissolve as the Internet of Things truly takes off. Morgan Stanley estimates that by 2020 there will be more than 75 billion devices connected to the internet, while comScore predicts that 50 percent of all searches will be by voice in 2020. At first glance, this seems an oversight, but we must also understand how and why people use voice search before deciding how to prepare to take advantage. These points start to direct search marketing efforts in the immediate short term. However, while Google Home and Amazon Echo devices are a common sight in modern homes already, we should view this as a stepping stone for the tech giants rather than a destination. Voice search will become much more conversational in its format and also more ubiquitous in its presence, as it will be embedded in billions of devices. Brands must be creative if we are to move past the stilted dialogues that characterize voice search today. Think beyond the current landscape: Voice can be an enduring way to engage with brands, but it must become more conversational. Audio clips in search results and branded messages via home devices will become commonplace soon. The early mover advantage will be significant. Focus on speed: Load time is already a mobile ranking factor and search engines should prioritize content that can be served immediately in response to voice queries. Be concise: Consider the reasons your audience would search via voice. 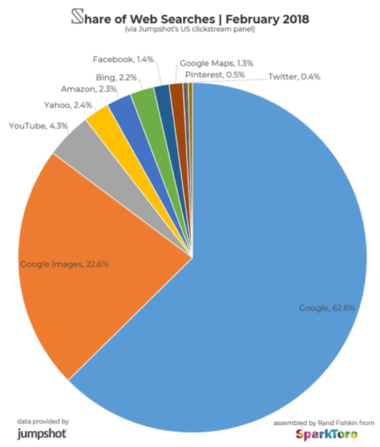 As Google’s research reveals, convenience is a key driver of usage. Incorporate this knowledge into your content creation and test different formats. Organize your information: A logical hierarchy of content, marked up with structured data, will help search engines navigate your websites and apps. As search develops into a multimedia experience, it also starts to fragment into a range of specialisms. We can see this if we look at popular vertical search engines like Kayak, Skyscanner, or Trulia. These websites cater to a specific type of industry (or vertical), which allows more a more targeted and streamlined experience. Erik Newton at BrightEdge, describes vertical search optimization (VSO) as the indexing and exposition of content focused on a site, category, or industry. Amazon is the giant in this space. With 55 percent of product searches now beginning on Amazon, it is the go-to place for online shoppers in the West. Although it still takes up a relatively small proportion of overall searches (2.3 percent in the U.S., as per Jumpshot’s data), Amazon’s dominance of overtly commercial searches makes it an enticing prospect for retailers. Similarly, search engines like YouTube continue to grow in popularity as people seek out particular content formats. While Google is aiming to incorporate all of this within its ecosystem, it will struggle to match the detail that a specialist service can provide in each area. For brands, this creates both opportunities and challenges. Maintaining an up-to-date presence across all of these vertical search engines can be time-consuming, but there are some consistent rules that can aid this task. First of all, we need to understand the usage patterns across each search engine. If we envisage search through the lens of the jobs-to-be-done framework, it becomes clear why vertical search is increasing in popularity. These eight steps help to put brands in the shoes of the consumer and maintain a focus on successful outcomes. From this perspective, it is evident that consumers will use vertical search when it helps them get things done quicker, better, or cheaper than traditional search. Brands can pinpoint these desires and map out content that caters to the shifting demands of the same consumer across different platforms. Analyze behaviors: People navigate to vertical search engines for a specific experience that caters to their needs. Analyze data across each platform to identify their requirements, so your brand can respond appropriately. Maintain a cohesive experience: Consumers expect a brand to communicate in a consistent way across all touchpoints. Search is a vital component of this branding strategy – especially across different vertical search engines. Integrate with vertical search engines: Work alongside the various platforms to integrate and serve your content in their results with minimal manual intervention. Optimize site experience: Consumers will often end up on a brand’s website as they explore further. This experience must match or better that of the vertical search engine if they are to continue the conversation. Search will be a unifying force among the various strands of digital engagement by the year 2020. Marketers should seize the initiative today and assume a leading role within their organization, as it is search that will underpin all of the emerging trends of the next few years. Through visual, voice, and vertical search, the industry will become a multimedia, omnipresent channel that guides consumers to better decisions and experiences. Brands that act today will be in prime position to capitalize for years to come.